This is another dish that builds on one covered previously – good old Scones! It’s moreish and quite delicious. It’s also very easy. Actually, it’s almost criminally easy. Criminal in that there is very little incentive not to just make a batch each and every day. 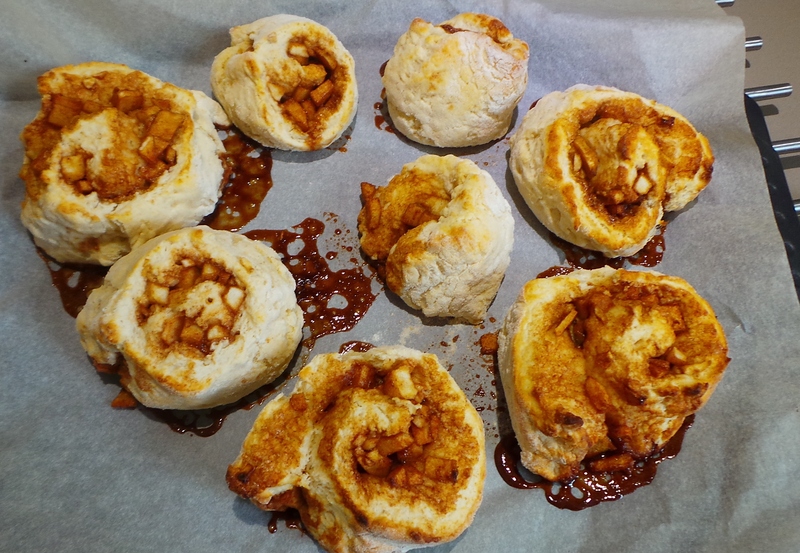 I created this dish in an attempt to recreate the apple scrolls I’m quite fond of getting from a local bakery. However, during our current budgetary regime, I simply can’t justify paying $4 for one of them. I can make a whole batch of these (8) for less than $2. Honestly. It also takes about 30 mins from start to finish. Make it with the kids and then get them to make it for you. Often. Herewith: start with a batch of scone dough. You’ll find the recipe here. Go make that up right now. We’re happy to wait for you. Once you get to the bit where you flatten it out, stop and head back here. Preheat your oven to 230ºC/475ºF. 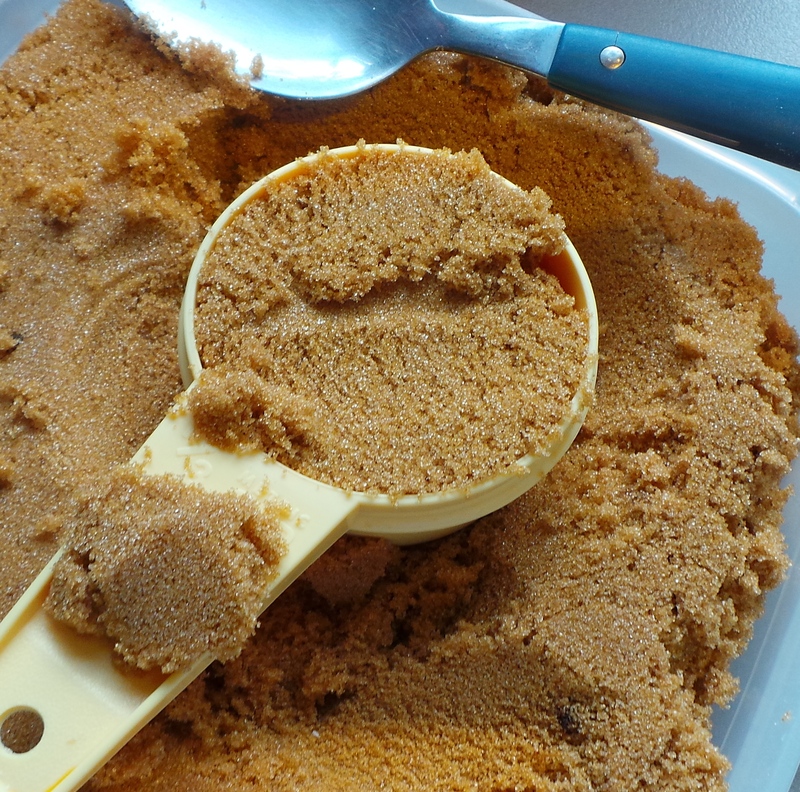 Now is the time to grab a small bowl and place ¼ cup of brown sugar into it. Start the madness with some brown sugar. 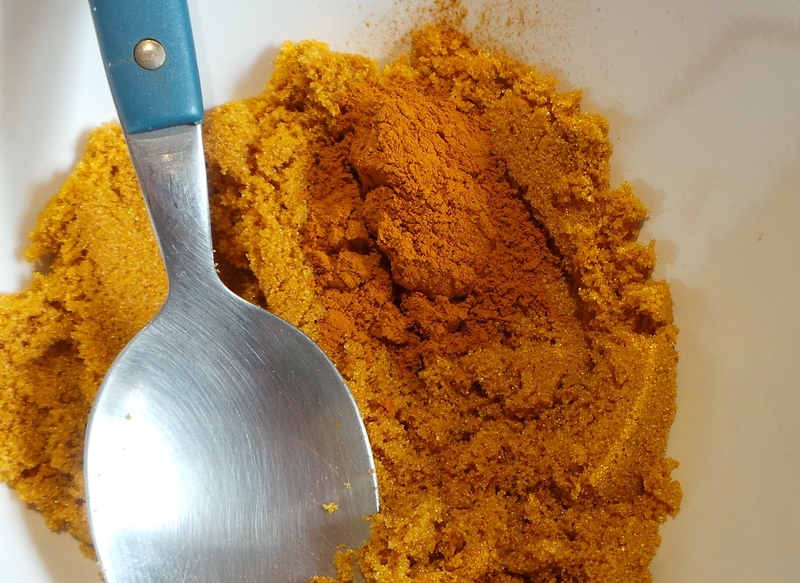 Then add 1 tsp of ground cinnamon and mix well. 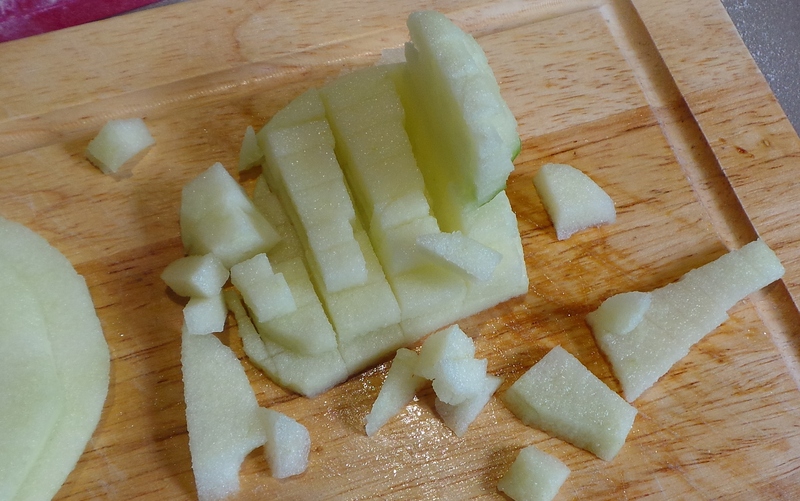 Peel a cooking apple and dice finely. Mix into the sugar and spice. This is your filling. Easy, wasn’t it? Now spread this over your scone dough as evenly as you can. Add to your scone dough. 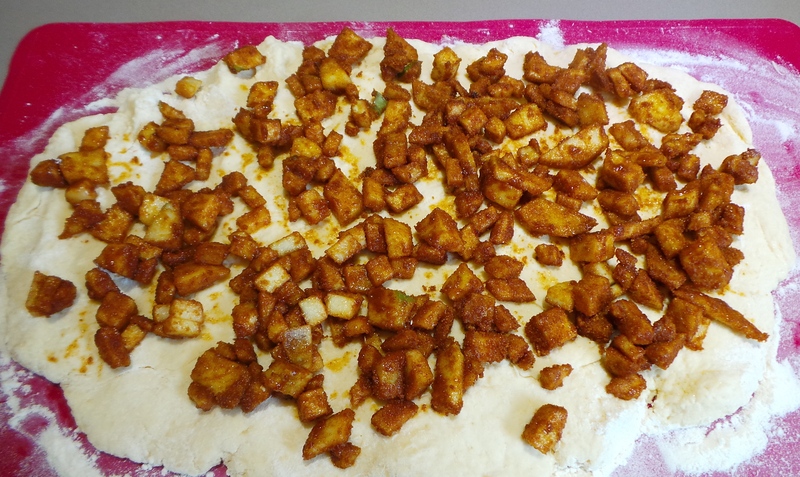 Roll it up from the long side and gently cut into evenly sized pieces. Divide into evenly sized pieces. Line a baking sheet with paper. Don’t miss this bit or you will have a big clean up job to do! Then place your slices on the paper cut side down. Squeeze them gently to round out any flattened edges. If you wish, you can brush with a little milk to aid in browning. Place your scrolls on a tray. 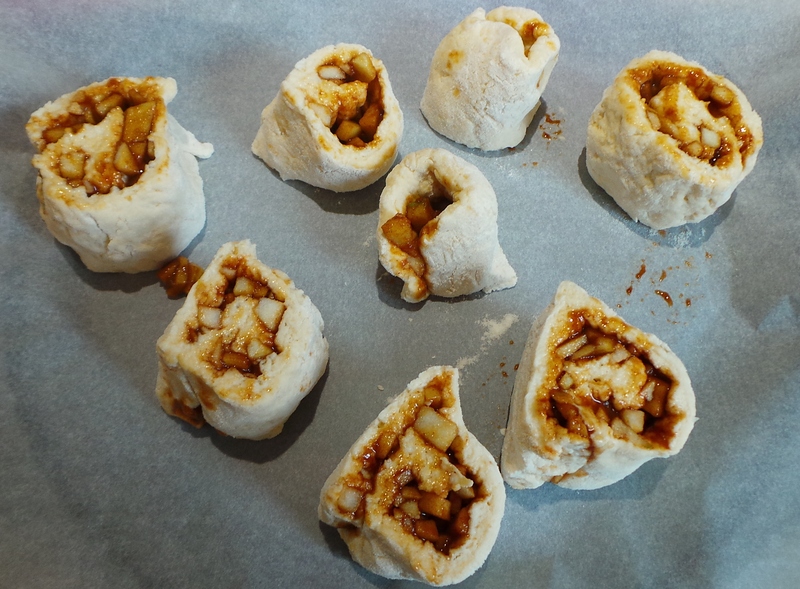 Bake for 10-15 mins, until a skewer inserted in the centre comes out clean. Can you see that shiny brown stuff on the paper? That’s caramel. Aren’t you glad you lined the pan? Transfer the cooked scrolls to a rack wrapped in a clean cloth to keep them soft. Serve when you can resist no longer. Heat the oven to 230ºC/ 475ºF. 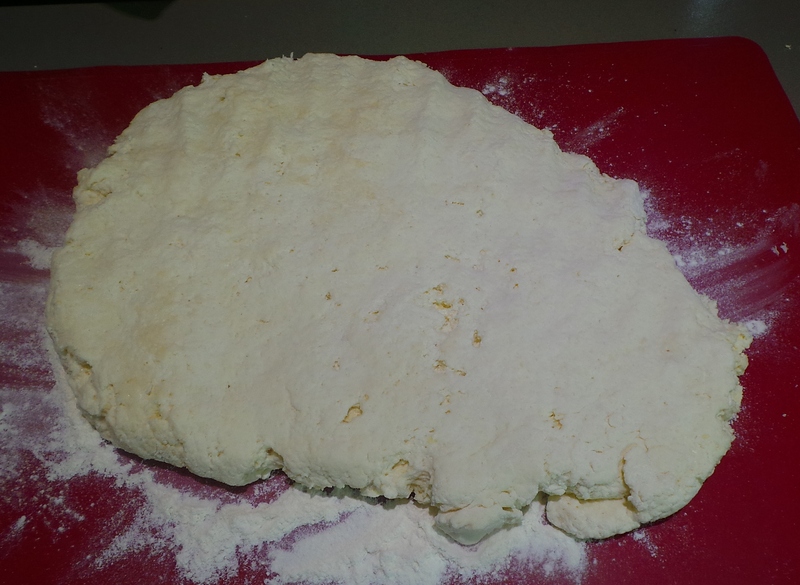 Prepare the scone dough and then pat out into a rough rectangle. 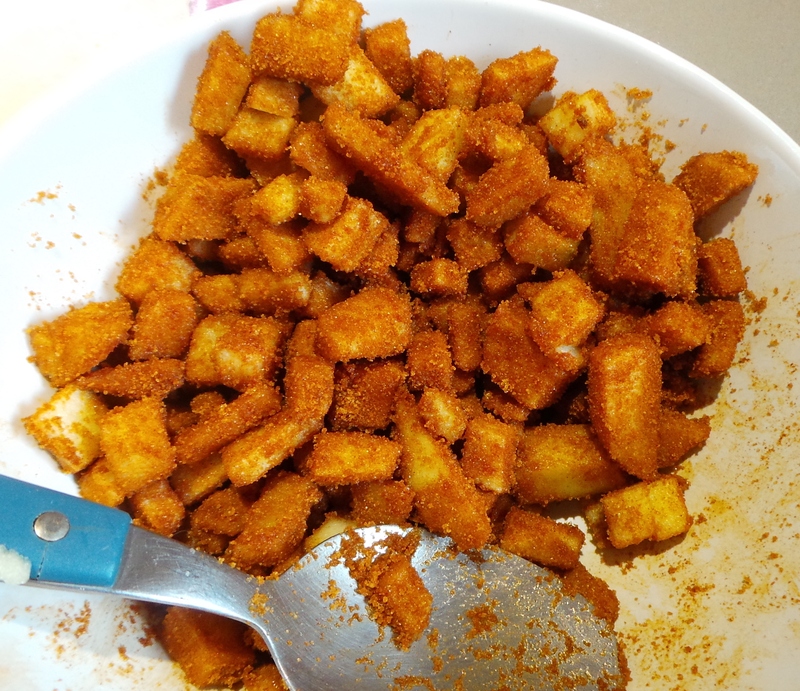 Mix the brown sugar and cinnamon together. Peel the apple and dice finely. Mix the apple thoroughly into the sugar mixture. Spread the apple as evenly as possible over the scone dough. Roll the dough from the long side, making a sausage shape. Cut into 8 even pieces. Start by cutting in half, then cutting each half in two and so on. Line a baking tray with paper and place the slices of the roll onto it cut side down. Squeeze gently into a rounder shape. If you wish, brush the tops of the scrolls with milk to make them brown nicely. Bake 10-15 mins until a skewer inserted in the centre comes out clean. Cool in a clean cloth to keep soft – or serve immediately. Variations: scatter a handful of chopped walnuts or pecans over the apple mixture before rolling up.